Here in Lynnwood, WA, superior dental care is what we do best. We’re proud to be a part of the community, helping fellow residents show off their pearly whites—with happy, healthy-looking smiles. If you live here, you already know our reasons to smile are vast and varied, and yes, the proverbial grass really is greener in our part of Washington! 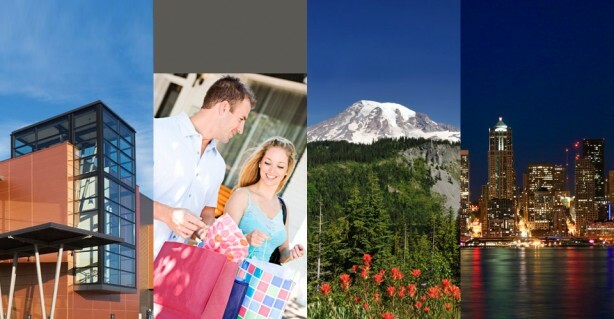 Lynnwood offers something for everyone, topped-off by a long list of year-round attractions and entertainment for your pleasure. Enjoying the best of both worlds: Just a short drive away from Seattle and its world class museums, shopping, performing arts, and the famous Pike Street Farmers Market, yet also a short jaunt to enjoy the great outdoors in the mountains or at the beach. Shopping, eating, and more shopping while visiting Alderwood Mall and dining at one of the many award-winning ethnic restaurants throughout Lynnwood..
Our numerous city parks allow you to get away from it all while staying in the city! Who wouldn’t love a picnic, outdoor sports activities, walking trails, zip-lines, and enjoying the wonders of a wildlife habitat a conveniently located in your backyard. Easy access to fun-filled activities that include golfing, whale watching, fishing, scuba diving, and extensive hiking and biking trails—not only do we embrace the great outdoors but we stay fit! The awe-inspiring scenery, peace and tranquility, absorbed via mountain climbing or hot-air balloon, or maybe up your adrenaline with sky-diving! The proximity of it all—city, mountains, country, and sea—at your fingertips. The aforementioned were just a few of many reasons why we’re proud to name Lynnwood, WA as our home. Isn’t it true that no matter the activity, or the company you’re with, being able to smile with complete confidence just adds that much more to your memory books? If there are aspects of your teeth that leave you less-than-thrilled and you feel it’s time to add a little “wow-factor” to your smile, contact us today. You’ll discover firsthand how Dr. Martin and our Lynnwood, WA dental team will help make your dream smile a reality, adding our dental office to your long list of reasons to love living in Lynnwood! Leave a comment: What’s your favorite part of living in Lynnwood? Where are your favorite places to go and why?